There’s a lot of new things for me to see in Vegas these days – not least of all the rain. But it’s not just this “actual winter” that’s popping my cork. It’s important to feel fresh, to see things fresh, and to be mindful. That’s what the Employee Assistance lady says. And I am trying.This is what I normally see when I ride. Commuter Cup. Riding against the flow of traffic is basically my only saving grace. 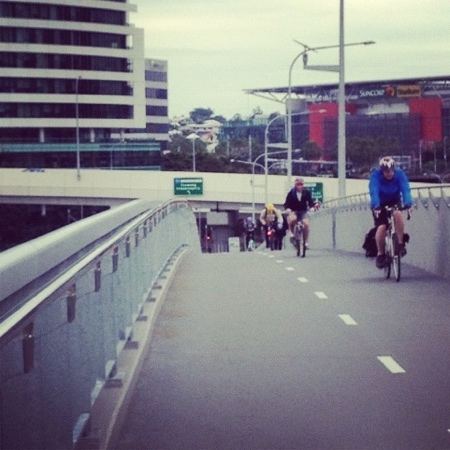 It’s a very small commute, but I tell you what there are some serious faces on the bikeway. These are my good things that I noticed this week. The new things, the unexpected things and what not. This is a cute couple. I know this already. Even though I didn’t even meet them. I probably will though, Brisbane is small. It’s what’s nice about it. They are having Vietnamese probably at Trangs. 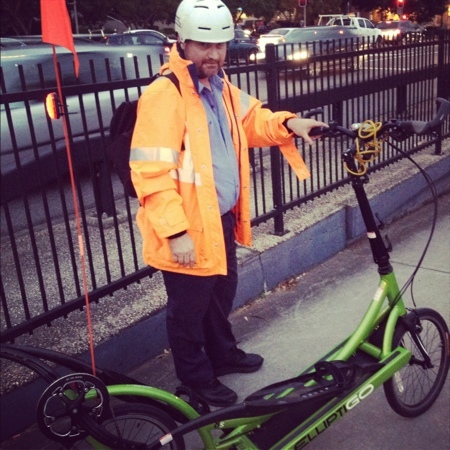 This is an Elliptigo. And an example of the few times when someone is like “yes, you can take my photo but no I don’t want to talk to you and I think you are weird and it’s dark and your photo won’t be good” and even though I’m asking all the right questions like “wow, how does it work and that high-vis jacket will light the shot right back up and what do I look like a professional photographer with my daggy pink i-Phone?” It was thoroughly weird. That thing is thoroughly weird. It’s an elliptical trainer on wheels. So you travel while making that circular leg motion like at the gym. When I think about it, however, it makes a damn sight more sense that doing that on a stationary elliptogonowhere at the freaking gym staring at yourself in the mirrors. So, smash it. 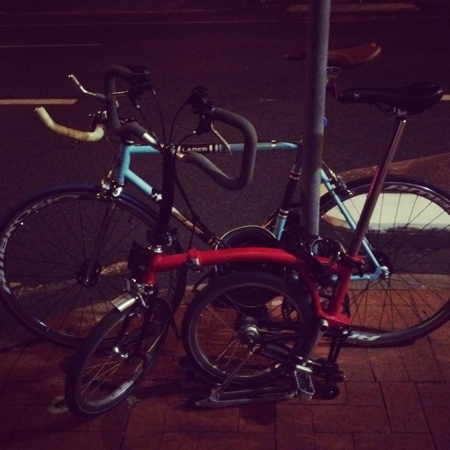 Sadly, only moments after this shot, the poor fellow binned it massively heading down to the bikeway. I can only consider this a sign that he was painfully embarrassed, because that’s basically the exact moment I am going to have a stack, when someone is looking at me and I am embarrassed. Either that, or the Elliptigo has the same turning circle as my Magna. 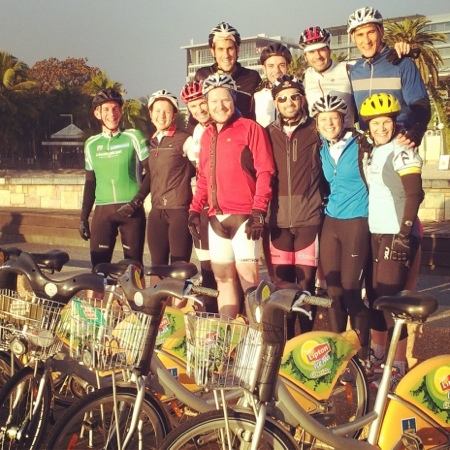 And, in a lovely follow up from our day of the dead here in Brisbane, I heard from Dustin (D1) about their really gorgeous farewell ride for the Canadian friend – a river loop on City Cycles for a departing member of their group. Plenty of double-takes along the way, apparently, (hells, I stopped for only two of them kitted in lyrca and checking out another cycle at the station), so 12 in a bunch must have been glorious! Here they are at the Southbank Pool, which is basically my favourite place to get my kitsch on. I love that place. Look at those bikeyfaces. You can also sponsor Dustin on the Smiddy Ride, so maybe see something new for yourself, a fellow who has reached his pledge level and is going for more – he has until Sept to raise more moola to support cancer research! Ride well Vegas. If you were the three folk on the bikeway tonight, I hope you made it home to warm socks and a warmer bed.